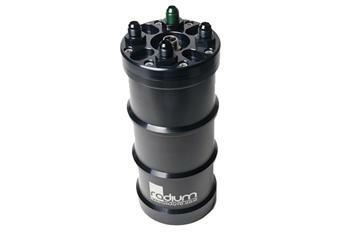 Radium Fuel Surge Tank - Standard UNIVERSAL - Dezod Motorsports Inc - Home of the automotive performance enthusiast since 2002. A fuel surge tank (FST) is designed to prevent fuel starvation to the engine on vehicles with inadequate fuel tank baffling. The FST fuel pump(s) directly feed the fuel rail(s). The volume of fuel inside the surge tank acts as a buffer to always keep the FST pump supplied with fuel. This volume is maintained by the main fuel tank’s pump as well as the fuel returning from the fuel pressure regulator. Excess fuel in the surge tank is returned back to the vehicle’s main fuel tank. 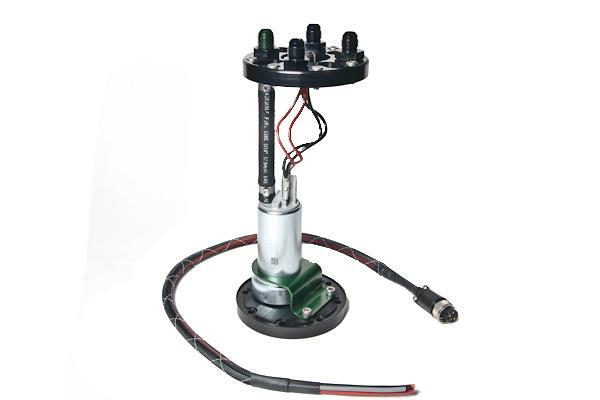 The surge tank also provides a quick and easy way to upgrade any standard fuel system without the need to modify the stock fuel tank or pump. This is an excellent fueling solution for vehicles installing large fuel demand power upgrades such as forced induction. Determine if your application will require one or two pumps. This is based on determining how much fuel flow the engine will need. Next, decide if the pump(s) will be purchased through Radium Engineering (pump included) or elsewhere (pump not included). Use the drop-down menu to make your selection. NOTE: When pump(s) are included, the FST comes fully assembled and is ready to be installed in the vehicle. When purchasing without pumps, use the included instructions to aid in the assembly. Next, select the fuel pump model that will be used from the options shown. This FST can be configured for single or dual pumps. This FST can be configured for single or dual Deatschwerks pumps.